Bollards & Post Covers | Reliance Foundry Co. Ltd .
Bollards enhance the visual quality of buildings and landscapes while providing visual and physical barriers for safer, more controlled environments. Detailed pricelists, including volume discounts, are available online. Visit our product category pages for price details. Request formal quotes at each item page for details and shipping costs to your location. Decorative bollards improve the visual quality of landscapes and buildings. A range of styles are available, including premium ornamental cast designs, to suit any historical or contemporary aesthetic. Easily adapt spaces with changing access requirements using removable bollards. Simple to install and remove, removable bollards control entry to restricted laneways, parks, and other spaces. Stainless steel bollards and bollard covers provide sleek, stylish design to any landscape or building. High-quality 316 stainless steel is used to provide exceptional corrosion resistance. 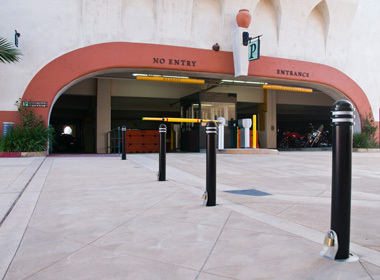 Fixed bollards are embedded in concrete surfaces to provide impact security to indoor and outdoor assets. Available in a number of styles and materials to suit any aesthetic. Provide traffic guidance in busy areas using flexible bollards. Flexible bollards provide visual deterrence, but do not cause or receive damage upon impact. 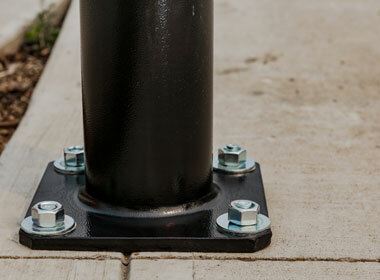 Bolt down bollards are simple to install in existing concrete surfaces. They are available in a wide range of standard and decorative options to suit any area. Solar-lighted bollards use high-capacity LEDs to illuminate pathways and parking lots to add safety after dark. Reliance Foundry’s solar bollards are durable and low-maintenance. Control access to multi-use spaces using retractable bollards: a simple, attractive solution that telescopes into in-ground receivers when unlocked. 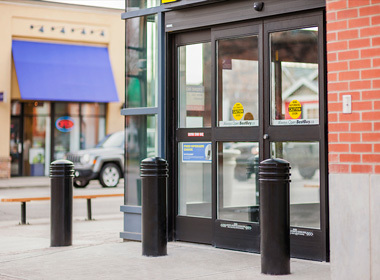 Protect pedestrians, work areas, and storefronts from vehicle collisions with safety bollards. 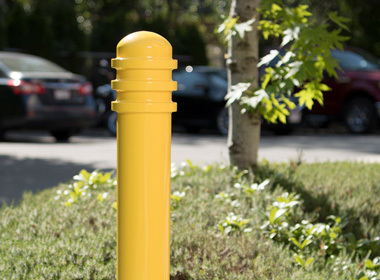 A range of bollard styles are available in safety yellow and red for high visibility. 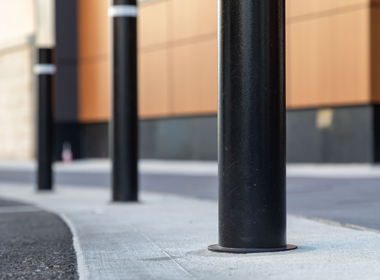 Simple and effective, steel pipe bollards can be embedded into concrete to provide security for building fronts, pedestrian areas, utility boxes, and more. 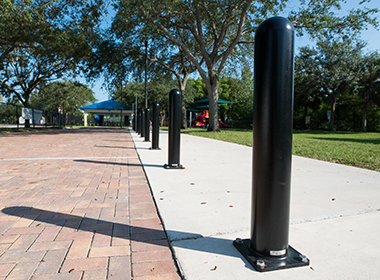 Protect the protection—bollard covers are easily installed over security pipe bollards to increase visibility and style, and reduce wear and corrosion. Various styles and materials available. 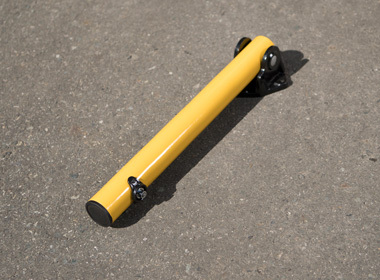 Add arms to select bollards to create 2-bike bike parking, or use the arms as handles for removable bollards. Bike parking bollards minimize clutter and obstruction from ad hoc bicycle parking. 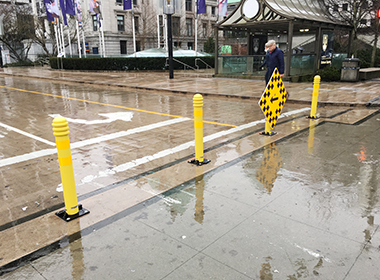 Fold-down bollards add manual access variability to restricted lanes and seasonal spaces. Collapsible bollards are easy to adjust between upright and collapsed, and do not require additional storage. 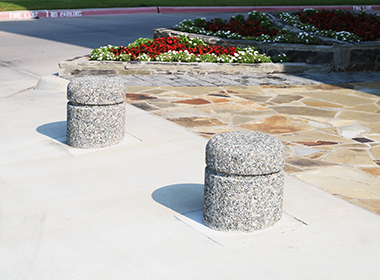 Landscape bollards increase safety while enhancing outdoor spaces. Bollards can also be used to guide pedestrians along pathways, and protect greenspaces. Parking lots are high-traffic area with many types of users. 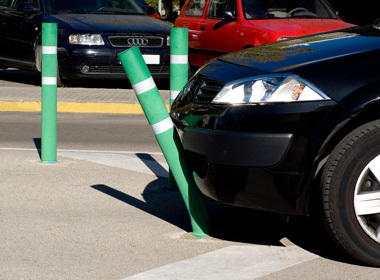 Parking bollards can help to protect pedestrians, buildings, and utilities from errant vehicles, shopping carts, and more. Direct vehicles and separate lanes using traffic control bollards. Traffic bollards are available in a range of styles, materials, and colors to suit any function. 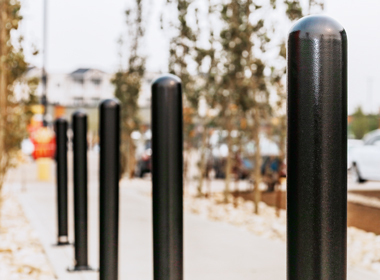 Lightweight aluminum bollards look as decorative and imposing as steel or iron, but are lightweight for ease in installation and removable applications. 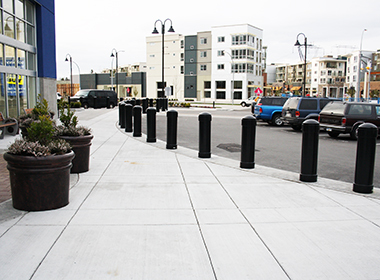 Concrete bollards are a natural-looking bollard option, perfect for parks or mixed-use urban environments. Multiple styles and heights are available. For economic, highly visible bollard protection, plastic bollard covers are a great addition to steel security posts. Plastic covers are easy to install and available in a wide range of colors. Polyurethane bollards are flexible bollards perfect for high-traffic locations where vehicle impacts are common. 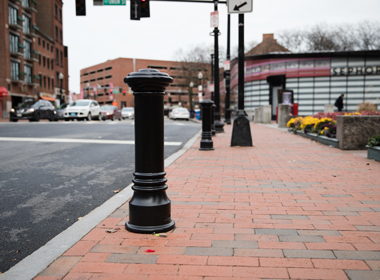 Polyurethane bollards provide visual guidance, but bend out of the way on impact. Reliance Foundry’s cast iron bollards are made from high-quality ductile iron for precision ornamentation and excellent strength. Iron bollards are available in a wide range of styles and sizes. 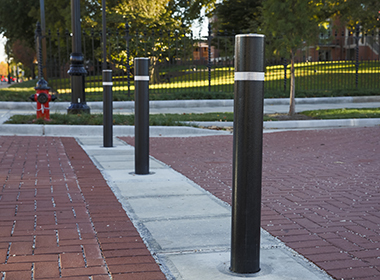 Low-carbon steel bollards offer exceptional strength and durability in any environment. Steel post styles are wide ranging, including concrete-filled steel pipes, decorative bolt-down covers, and more. Reliance Foundry supplies a range of bollard accessories to modify or enhance bollard installations. 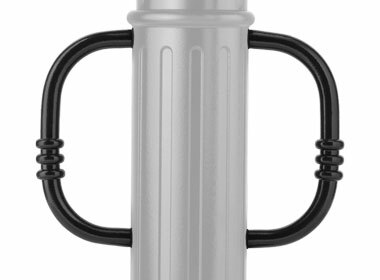 Accessories include bike-locking arms, alternative mounting options, connecting chains, and more. 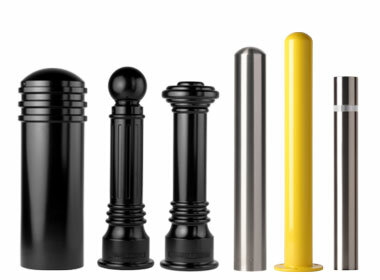 View all of Reliance Foundry’s available bollard styles. Decorative bollards are hardscape option to improve the visual quality of buildings and landscapes. Choose from a range of styles, including premium ornamental cast designs—made from ductile iron or aluminum—to suit any historical or contemporary aesthetic. Decorative bollards reinforce separation and cohesion in landscape designs while increasing safety and walkability for pedestrians. When used to complement new or existing architecture, bollards reinforce thematic visual cues and enhance a sense of place within a neighborhood or community—and for approaching visitors. 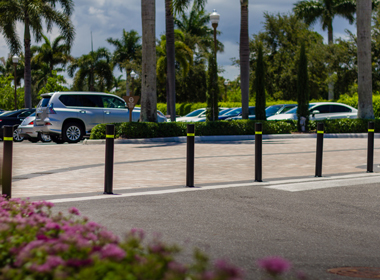 Traffic bollards establish important visual cues for drivers—helping create more stimulating environments for safe and responsible driving. Bollards stand at an optimal height for driver visibility while maintaining clear sightlines and pedestrian flow where needed. 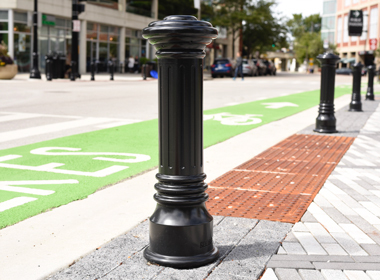 Simple, bolt-down bollards can be used to complement new or existing traffic management devices—including signage, road barriers, curbs, speed bumps and crosswalks. Bollards also provide visual indicators around sensitive areas such as exposed building areas, utility boxes, parking attendant booths or pedestrian walkways. When used in dense urban areas, bollards segment bike lanes and pedestrian walkways to ensure safety for all modes of transportation. For parking areas and restricted access roads, bollards can be installed with versatile mountings to allow temporary or seasonal access. Bollards present clear, visible barriers for off-limit or sensitive areas. Steel-pipe security posts are made from structural grade steel and can be reinforced with concrete to withstand high-impact vehicle collisions. 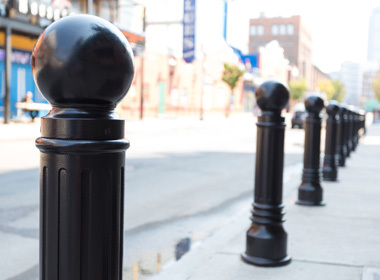 Use security bollards on their own as stand-alone posts or to reinforce decorative bollards. 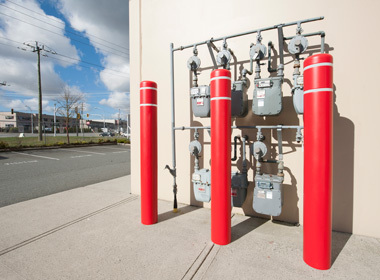 Stand-alone security posts can be covered with cost-effective plastic sleeves to ensure protection from corrosion and to maximize visibility. 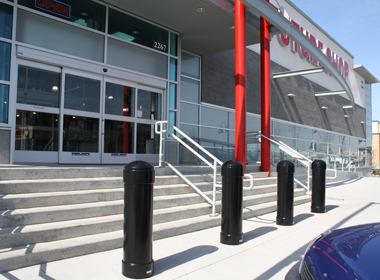 Steel-pipe bollards are ideal in pedestrian areas—such as building entrances, transit hubs or parking-lot walkways. They are ideal for areas with vulnerable populations—senior citizens, young children or people with disabilities. Security posts also protect vulnerable building areas from deliberate ram-raid thefts. 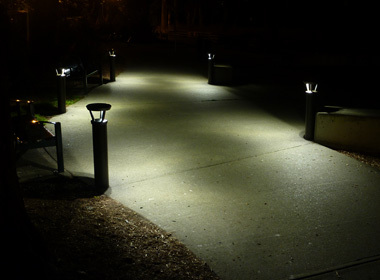 Light bollards are ideal for lighting open areas and pathways. They feature LED lighting heads powered entirely by solar cells—requiring no hardwiring or trenching. Intelligent energy management systems take into account available sunlight and seasonal weather patterns to conserve energy and maximize output at desired times. Choose from a range of color, distribution and scheduling patterns. Reliance Foundry was built on a tradition of providing the highest-quality cast metal products. 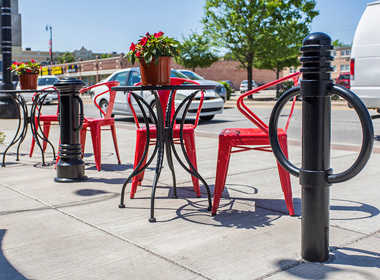 Bollards are available in a range of ductile iron, steel, aluminum and plastic materials. Iron, standard steel and aluminum products are powder coated to ensure lasting durability and improved visual quality. 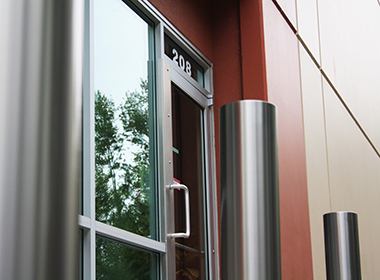 Stainless steel bollards offer clean aesthetics that will resist rust in corrosive environments. Select from a range of installation methods based on the product/model and intended site/application. Fixed mounting styles include embedding into new concrete and bolt-down flanges for new or existing concrete. Removable mountings are also available for most Reliance Foundry products. Detailed pricelists, including volume discounts, are available online. Visit our product category pages or individual item pages for price details. Request formal quotes at each item page for details and shipping costs to your location.